New Belgrade Flea Market, originally uploaded by bill kralovec. 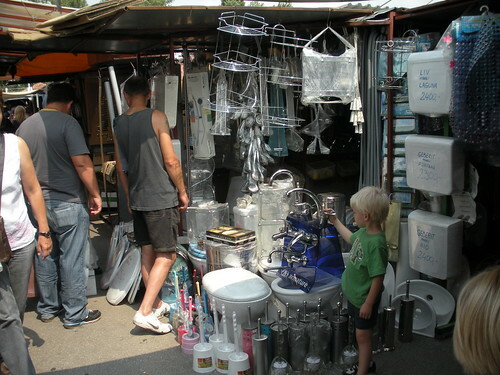 My son Oliver is above checking out bathroom fixtures at the New Belgrade Flea Market (Buvljak – in Serbian). I needed a new plug on an extension cord I use to mow the lawn with my electric lawnmower. I found the plug and the guy connected it to my cord for 300 RSD ($4.50).I also saw some small soccer goals I’m thinking of purchasing for the school. The place has everything, literally everything. From Nike shoes, to fans, from pirated DVDs to ladders. It is a huge open market with narrow stalls. The flea market is located in New Belgrade, just down from the Delta City mall. It is always busy and there is a variety of people there. Everyone is pretty friendly and we’ve never had a problem there. Nadia found a booth selling IKEA products. IKEA is one of her favorite stores and the nearest outlet is in Budapest, 5 hours away. In front of the flea market is an unofficial flea market. It is filled with gypsies selling junk they find in the dumpsters around the city. I’ll take some photos there the next time we go. Sofia is getting an IKEA in a year or so and I’m sure they’ll be building one between on the outside of Belgrade towards Novi Sad as well. Those markets are smaller now and will be more smaller. This represents change in culture. Good or bad? I like the markets as the experience of buying food is a bit more personal and “exotic” than the regular supermarkets. I like the convenience of supermarkets however, especially when we buy in bulk for my family. The flea market is colorful and it would be sad to have the markets eventually end. It is another way that Serbia is turning into any European country. I just bought three Robert Ludlum paperbacks, in English, from a Romani (Gypsy) man in front of the New Belgrade buvljak. Being in good shape – and cheap! – I’d hardly call them junk fished out from dumpsters. I’d venture to say that the same goes for most of the stuff in the unofficial part of the flea market, as well-worn as it may seem. Not to mention that not all the vendors there are Roma.